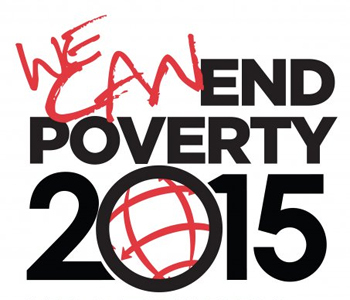 In 2000, 189 nations made a promise to free people from extreme poverty and multiple deprivations. This pledge became the eight Millennium Development Goals to be achieved by 2015. Based on a review of 50 country studies, the assessment “What Will It Take to Achieve the Millennium Development Goals? – An International Assessment” released by UNDP in June 2010, finds that the resources and know-how necessary to achieve the MDGs exist. Acceleration of progress over the next five years will need to focus on continuing proven strategies, policies and interventions and making a radical break with those that do not work. In this post I’m focusing in the sub-Saharan region to analyze the impact the strategies developed to achieve the MDGs have had and the gap that still has to be bridged to reach the mentioned goals by 2015. The analysis is made from the perspective of the three main Human Development Indicators: Education, Health and Income and therefore limited to goals 1, 2, 4, 5 and 6. But, first of all, let’s have a global graphic view of the current situation in the sub-Saharan region. The following chart presents an assessment of progress based on selected indicators. Trends and levels are assessed on the basis of information available as of June 2011. The latest available data for most indicators are from 2009 to 2011; for a few indicators, the data date back to 2005 or 2007. 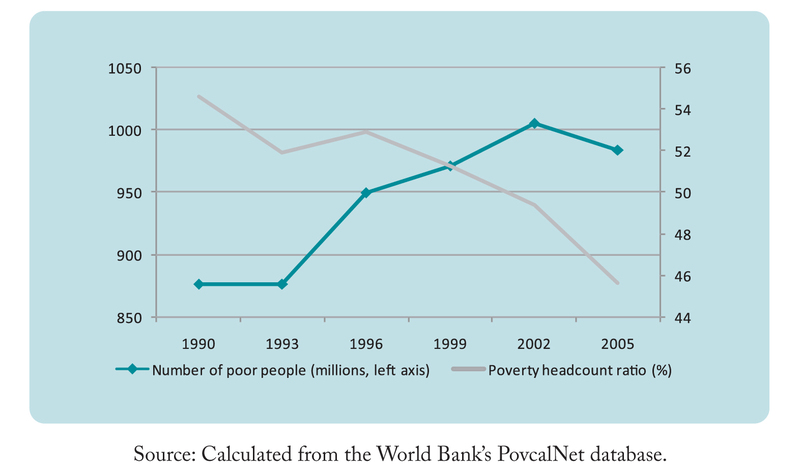 Regarding Income Index and Goal 1, poverty in sub-Saharan Africa is falling. Based on recent economic growth performance and forecasted trends, the extreme poverty rate in the region is expected to fall below 36 per cent. However, the level is still very high withmore than half of the population below the poverty line. Moving a little bit backwards I’d like to underline that it is most worrying that in sub-Saharan Africa and South Asia the number of poor people increased from 877 million to over one billion people in 2002, mainly driven by high fertility and population growth rates. The trend is encouraging as the number of poor people fell to 984 million by 2005. Another important facts related to this goal are the increase in the vulnerable employment rate that was found in the region as well as the difficulties to meet the hunger-reduction target. 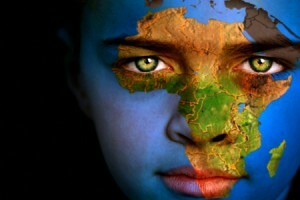 Based on current trends sub-Saharan Africa will be unable to meet it by 2015. A revealing fact is that 44 percent of children under five suffered from stunted growth in 2006, a telling indicator of chronic under-nutrition. 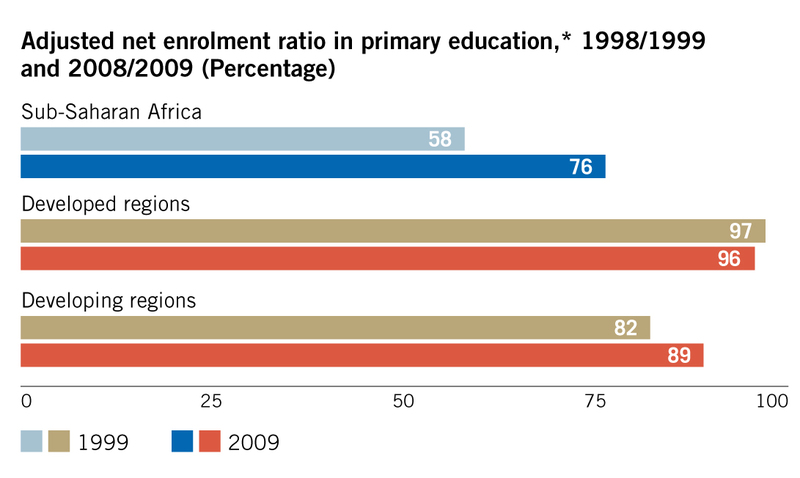 Regarding Education Index and Goal 2, sub-Saharan Africa has the best record for improvement in achieving universal primary education, with an 18-percentage-point gain between 1999 and 2009. The abolition of school fees, supported by reforms in education systems and investments in school infrastructure and human capital, leads to high enrollment rates in primary schools. However, the majority of out-of-school children in sub-Saharan Africa are largely excluded from education, and most will never enter a classroom. It’s also a relevant fact the quality of the education given. One measure of it is a student-teacher ratio of no more than 40 to 1, as recommended by the Education for All Fast Track Initiative (EFA-FTI). However, pupil-teacher ratios in primary schools across sub-Saharan Africa and in four sample countries have increased between the pre-MDG and post-MDG periods. 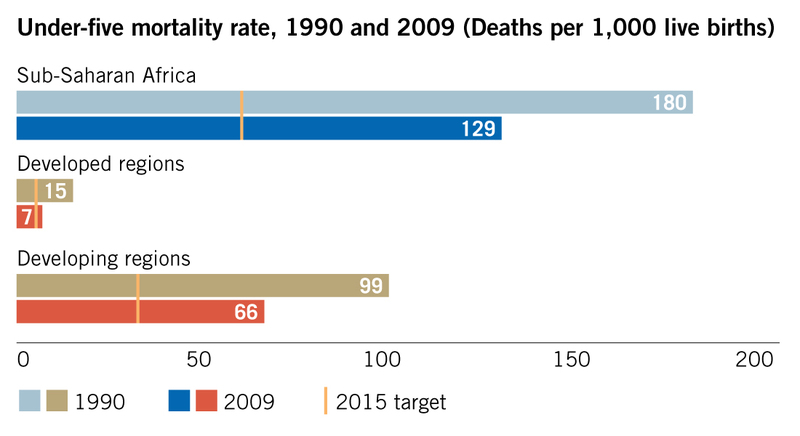 Regarding Health Index and Goals 4, 5 and 6, sub-Saharan Africa still has the highest levels of under-five mortality, where one in eight children die before the age of five (129 deaths per 1,000 live births), nearly twice the average in developing regions overall and around 18 times the average in developed regions. 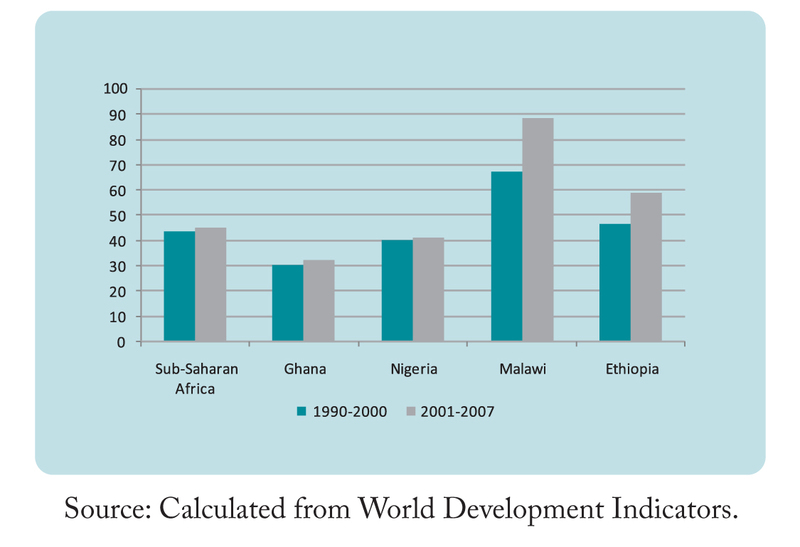 With rapid progress in other regions, the disparities between them and sub-Saharan Africa have widened. In sub-Saharan Africa, diarrhoea, malaria and pneumonia are responsible for more than half the deaths of children under five. Maternal deaths are concentrated in sub-Saharan Africa and Southern Asia, which together accounted for 87 per cent of such deaths globally in 2008. The ratio has fallen by only 26 per cent in sub-Saharan Africa, though evidence suggests that progress has picked up speed since 2000. The vast majority of maternal deaths are avoidable. The largest proportion of such deaths are caused by obstetric haemorrhage, mostly during or just after delivery, followed by eclampsia, sepsis, complications of unsafe abortion and indirect causes, such as malaria and HIV. According to recent findings, without HIV, maternal mortality would have been 18 percent below its 2008 level. Studies have also shown that the likelihood of maternal death increases among women who have many children, are poorly educated, are either very young or very old, and who are subjected to gender discrimination. 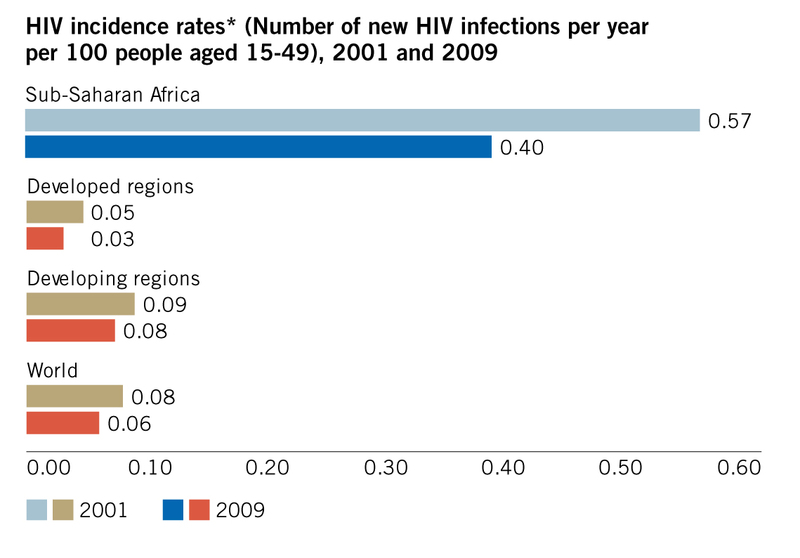 Regarding HIV, Sub-Saharan Africa remains the most heavily affected region, accounting for 69 per cent of new HIV infections, 68 per cent of all people living with HIV and 72 per cent of AIDS deaths. Two thirds of new infections and a similar rate of those currently infected live in this region of the world. Recent data from population-based surveys in selected sub-Saharan African countries show that the proportion of young people who know that using condoms can reduce the chances of getting HIV ranges from about 50 per cent to almost 90 per cent in some countries. However, in almost all countries surveyed, young women are less likely to have such knowledge. Regarding Malaria, the past 10 years have seen a remarkable surge in the production, purchase and distribution of insecticide-treated mosquito nets globally, particularly in Africa where about 1 million people die each year from malaria, with 88 percent of the deaths occurring in sub-Saharan Africa. Data from household surveys indicate a marked increase in both net ownership and use among children. Most African countries with data for 2009-2010 show increased mosquito net coverage and reduced disparities among various population groups—largely due to nationwide campaigns for the distribution of free nets that emphasize poor, rural areas. 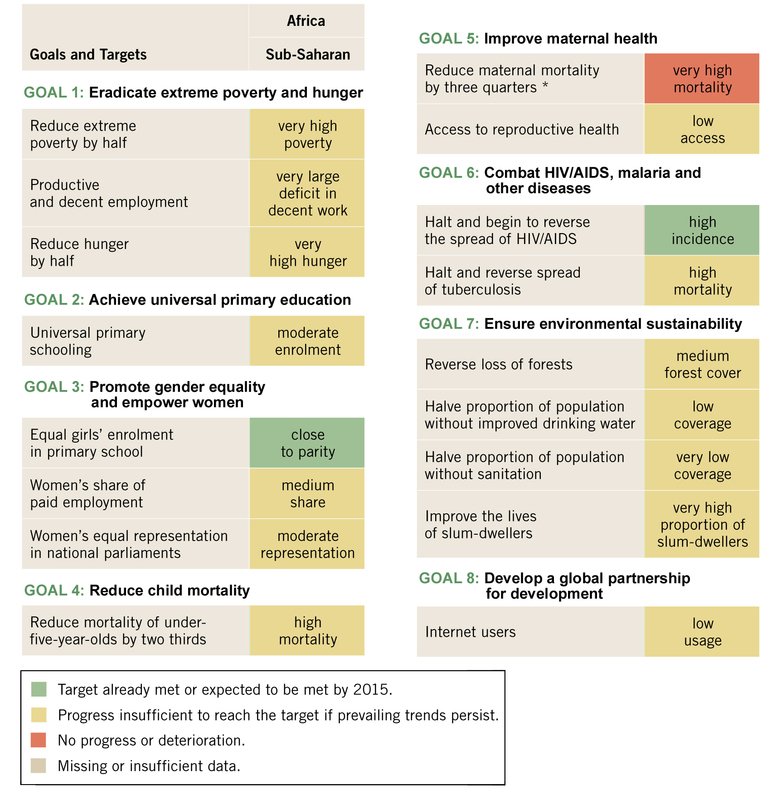 From this analysis it can be concluded that, although the 8 MDGs have galvanized unprecedented efforts to meet the needs of the world’s poorest, there is still a lot to be done in order to achieve success by 2015. 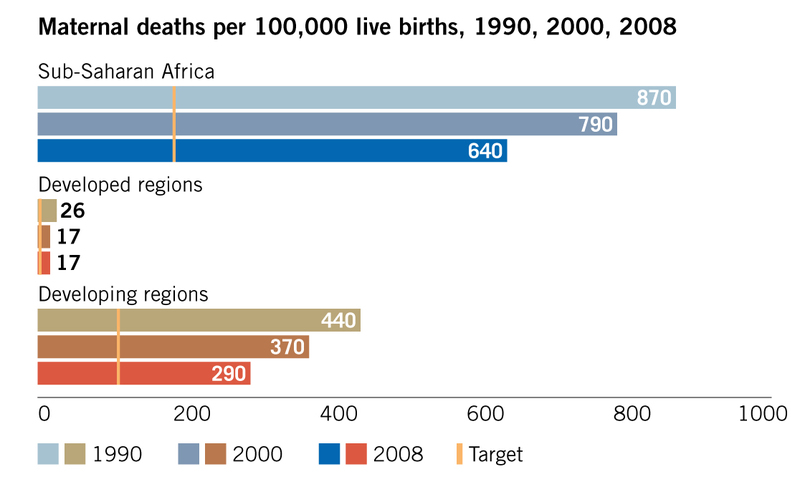 In the case of sub-Saharan Africa progress should be accelerated over the next years, as the region hasn’t shown enough improvement in most of the goals and targets, moving even backwards in the field of maternal health.